So, today’s the first official installment in our contentment series! 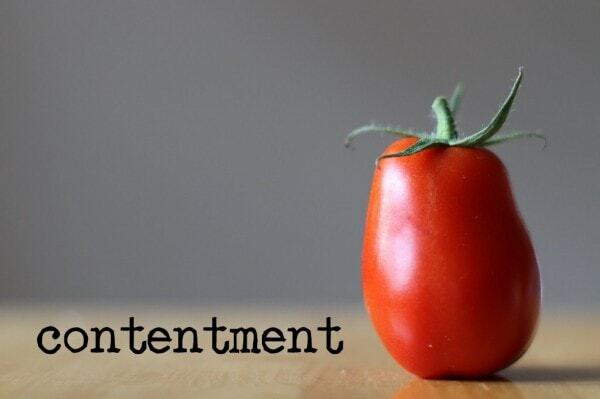 Today’s post and the following two will be about ways that you can be intentional about growing in contentment. I feel very strongly that contentment is not something you can sit around and wait for. I know that sounds like such an obvious thing to say, but I think we often fall into that kind of thinking without even noticing it. Have you ever thought something like this? When we think thoughts like this, we’re pinning our hopes for being content and happy on some thing or some event or some change. Who knows? Maybe some of that change we long for will come into our lives. If it doesn’t, though (or if it takes a long time!) some contentment skills will come in very handy. I am certainly not immune to thinking that my discontent is tied to some sort of lack in my life. To keep this nice and real, here’s a list of things I can easily be discontent about. I know that many of you face challenges which far exceed mine (you’ll probably read this list and wonder what is wrong with me! ), but these are my honest temptations. If I sat here long enough, I could think of more. I should probably stop, though, because pondering unhappy things in my life isn’t terribly helpful. So, what do I do when I get down about these things? Most times, by the grace of God, I look for the good, and I try to focus on that instead of on the bad. There are some situations where it’d be pretty difficult to find anything good (the oppressive situations many people in other countries face come to mind), but for me and probably for most of you, this is not the case. If we try hard enough, we can probably find something to be grateful for! Here are a few examples of how this plays out for me. I hate split-foyers and I don’t like how closed my floor plan is, and I doubt that will ever change. But, I love the neighborhood we live in. The towering oak trees, the wide streets, the space between houses, the pier at the end of the road…I purposely think about that instead of about our house being a split foyer. Also, I like the fact that we have a yard. I can grow things, my kids have a swing-set, and they can play in the yard. Plus, our house is within a very short driving distance of grocery stores, thrift stores, my bank, my music store, the library, and several produce stands. Sure, it would be lovely to have a new van with more space and a nicer smell (we have cleaned the carpet and Febrezed it, by the way!). But there are good things about my van…it’s paid for (that’s the best kind of car to have! ), it’s reliable (we’ve only had one non-maintenance issue with it and it’s got over 100,000 miles on it now), it’s got space for all six of us, plus room for one extra person, it gets good gas mileage, especially for a van, and it’s black (I’d much rather have that than some sort of really loud or really dated color). I’m sure you know that when you live with people, their flaws become glaring. If I don’t make an effort to the contrary, I can start to see only the flaws in my family, and that’s a recipe for discontent. When I purpose to see the good in my husband and children, though, my attitude changes. Yes, Sonia and Zoe fight a lot, but they are getting better at playing together. Yes, Zoe can be awfully high maintenance, but she is hilarious. Yes, Joshua sometimes has difficulty being kind to his sisters, but he’s generally a thoughtful guy. Mr. FG doesn’t always do everything the way I want him to (hard to believe, I know ), but there are many things he does well (you can read about them in my anniversary post). Mr. FG has had some very unpleasant work schedules over the years, and his current one is kind of bad (we’ve had much worse, though!). We go to bed at 8:00-8:30 pm, and get up at 4:40 am, and since he works Tuesday-Saturday, we have to do this even on Friday nights, which means we miss out on some fun activities then and during the week. His schedule also makes it hard to carve out time for just the two of us because the kids are always up while he’s home. On the upsides, though, he has a job, which is a huge blessing. And the early schedule does give me time to blog before the kids get up. Mondays off are weird, but at least we homeschool and so we can all be off on Mondays. And if we want to do something together as a family, Monday is a good day…nothing is crowded on Mondays! I know some moms really enjoy having a career and they find it to be fulfilling, but I never, ever wanted to be a working mom. Ever since I was a little girl, I wanted to be a stay-at-home mom. But, our financial circumstances have always made it necessary for me to work part-time, mostly in the form of teaching piano. This has definitely tempted me to be discontent over the years, mostly because of the time this takes away from my kids. There are things to be grateful for here too. I’ve been able to teach at home, set my hours mostly as I wish, and keep my kids at home (the moms of my students have always watched my kids). I’ve been able to work at something I love (music), doing something I think is important, and I’ve been able to provide some necessary income. And more recently, I’ve been able to cut back my teaching hours significantly and that has made more time for mothering and homeschooling. Hopefully that gives you a bit of an idea of how this works in my life…I could flesh out more of these, but my children want some breakfast. The idea of looking for the good is so simple, but so hard to consistently apply. It takes real mental work to shift your focus from the negative to the positive, from the bad to the good. But based on how I see this working out in my life and my children’s lives, I really do believe that it is effective. In fact, just as I was typing the section about working, I saw this in action. I felt a little bit bummed out after writing the first paragraph, but after I finished the second one, I no longer felt that way. I see it working in my children too. Recently, Sonia went through a phase where whenever anything went wrong in her life, she’d fall into the depths of despair and declare, “This is a hooooorible day! !”, or “I hate this day!”. To help her quit this habit, I had her immediately sit down wherever she was and think of 3 things to be grateful for. It was amazing to see the transformation come over her as she counted her blessings…as she thought of the first blessing, her frown persisted, but usually by the time she got to the 3rd blessing, her bad attitude was gone. And amazingly enough, after some time she stopped making horrible day declarations altogether. Looking for the good is definitely not the only way that I deal with my temptations to discontent…there are two other really important tools in my contentment toolbox, and I’ll share those with you in the next two weeks. Thank you for posting on this topic! I am really looking forward to learning more about your contentment tools, as my husband and I are preparing for our first baby and also for me to stay home with him. Me, too, Samantha! Only ours will be a girl. When are you due? I’m due December 17th. I have to admit that this first pregnancy has not been very comfortable at all, but I try to find ways to enjoy it (got to feel her hiccuping the other night and will be going on a babymoon this weekend). I know it goes against the whole of Kristen’s post to say it, but I can’t wait ’til she’s here! I’m also content with this phase of looking forward to her birth, though, so I guess it’s okay. Ooh, I HATE being pregnant. Except for feeling the baby kick and knowing that I’d get a delightful little person at the end, there was nothing I enjoyed about pregnancy, even if I put the hyperemesis to the side. So, no criticism from me…I started counting down to my due date practically from the moment I found out I was pregnant. I tried to be content while I was pregnant, but I really, really did not enjoy pregnancy. OOH, I loved being pg. well execpt when I was having morning sickness. (thank goodness it was always at night when I was home, not when i was at work!) For me I am very sad that I will never get to have that experiance again! Yes its hard to finally “meet” that person that was growing in your belly. AT one point I thought I would never have children, So i guess I am blessed that I finally was able to! I am an older mom (41), and the kids( 4 1/2 and 2) poop me out, but I wouldnt’ change it for the world! Hello. Thank you very much for this post. Contentment is a grace that I am sure that I will struggle with at times until Glory! I too have a split level home. It is not perfect, but we too live on an awesome street and have awesome neighbors. So I try to make my imperfect home as lovely and well suited to my family as I can- with the helf of thrift shop finds! Focusing on the good does help me a lot especially when we are visiting my brother’s and brother-in-law’s brand new, huge, beautiful homes! That is when I try to focus on the fact that I have been given much more than I deserve, and that it costs more to live on the East Coast by the ocean! Large beautiful homes are a lot more work to maintain, keep clean and keep tidy. Not to mention pay for! And split levels give you a bit more exercise than, say, ranches. FWIW, I loved my house when I moved it, now it seems humdrum and everyday (which it is for me – I live in it every day after all); perhaps even the most awesome place can lose apparent awesomeness over time. But it’s still the same place so it still must be awesome, right? I don’t mind having steps. Heck, I had 3 levels at my townhouse and that never bothered me. What bugs me is the lack of a foyer area. When 6 people come in at one time, it’s a disaster. I like how you have you are trying to teach contentment to your children. I need to have my son do the three things exercise too! He is a glass-half-empty person by nature and I need to work on giving him a way to see things differently. Thank you for this series on contentment. At my place in life, it is easy to see how things might have been, if only this or that…however, things are as they are and wishing them differently won’t change a thing. What needs to change is my own attitude. When I look around at my too small apartment, I need to focus my eyes on the view from my back porch…acres of wild land in a wildflower preserve. When I gripe about my college student granddaughter living with me, I need to see her as an amazing young woman who has overcome such obstacles to turn her life around. When I worry about how to stretch my money to pay the bills each month, I need to be grateful for having a simple life with simple pleasures. When I sometimes wish for my former life, I need to focus on the present and see all the beauty around me every day. Life is short, imperfect and transitory….how we appreciate each day is what’s important. This is a great post, Kristen. Very honest. I have been thinking about this subject for several months now. All summer I felt like I was always thinking: I can’t wait until I’m not pregnant anymore, I’ll be happy when we can afford a new vehicle, I’ll be able to feel more at home and comfortable if we bought a bigger home, etc. Lately I’ve been taking these thoughts and banishing them with prayers and more positive ideas. It really works! The other day I found myself slipping into the trap, “I can’t wait until things are back to normal,” I said to my husband. He replied, “It is normal,” was his reply. That struck me as very very true…and I’ve been thinking of it ever since! What your husband said is very true and I need to remember that also. I love this article. I’ve been married for almost 28 years and for a very long time all I did was find the negative in things — especially my husband. After several arguments, my husband would say that I am too negative and I need to be more optimistic. Well, I finally realized what he was saying and what a great guy he is. Yes, he leaves laundry on the floor and dishes on the counter, but he cleans the house one day a week while I’m at work, he lets me travel to visit high school friends for a weekend and he lets me participate in hobbies that I love (which also means spending money). And best of all, he loves me. Marriage is seeing the good over the bad and not all the bad all the time. One of the few good things about getting older is that it is much easier to be content. By 60, you have figured out what things are important and what doesn’t matter. I no longer care if I my house is up to date or I can afford bigger or better. Spending time with my granddaughter and enjoying time with my grown children is about all I care about, now. When you are younger it is too easy to wish your life away. “I wish the baby was out of diapers” etc. You find out it is better to enjoy each stage as much as you can. It all goes by so fast. My mom totally agrees with you on that! Attitude (all of our attitudes in this house – mine, especially) has so much to do with contentment. Often when I find myself irritated or unhappy, I realize (too late sometimes) that what I’m really thinking is “I deserve better” or “It’s not fair” or some such selfish nonsense. Believe me, it’s sooooo easy to fall into this. I like your idea about meditating on 3 things to be grateful for…I think maybe we should institute ‘Wonderful Day Declarations’ as an on-going theme in our house! After waking up this morning on the verge of tears, you have changed my day. Thank you for your post and your reminder to look for the good, the beautiful, and the positive. We are in the middle of significantly downsizing our life and after taking boxes after boxes to the ebay store yesterday I could be a real mess. The grace of God though fills me and your post reminds me of what is good. Thank You Kristen! I agree with your general point but I also think that one can be more content when stressors are removed. On the list you mentioned, the baby out of diapers and being out of debt are prime examples; moving to a bigger house (assuming one doesn’t have 6 people in a 1 BR apt) aren’t. I doubt that the baby being out of diapers will make one content in an absolute sense, it could definitely make one more content than before. That said, I agree that attitude makes all the difference in how content one is, given a fixed set of conditions. And the reminder is well timed, today is a good opportunity to practice. Sorry about the terrible copy-editing – dunno what happened. Yes, I wouldn’t disagree with your first point. What I was trying to say is that you don’t have to enjoy the diapers themselves, but that you should look for the good parts of having a baby that is of diaperable age…the sweet little feet, the chubby cheeks, the cute baby voice, the snuggly, warm body, and so on. I’m thrilled to PIECES that we don’t have diapers in this house anymore. But while we had children in diapers, I definitely made a concerted effort to soak in all the wonderful things about babies/toddlers. Anyways, there are definitely stages in life where it’s easier to be content (I’m much more naturally prone to being content when I am not pregnant), but if you can learn to be content, you’ll be a happier person even in the midst of a hard stage. There have been several studies on happiness and the relationship between being content with what one has and one’s overall happiness. For example, the cumulative long-term effect of becoming a quadrapalegic and winning the lottery are basically the same – 10 years later, the victims of both rate their day-to-day happiness about the same as they did before the incident. Granted, happiness and contentment are not exactly the same thing, though they are related. Kristen, I love this series you’re doing. I’ve read about using a “gratitude journal” to record 3 things to be grateful for at the end of every day, but haven’t completely put it into practice. Grateful to have a little kick in the pants on that one. Thanks for this, Kristen. I have always been pretty content, but I’ve struggled during some rough spots in the road, especially on the occasional day from Hades. LOL It’s encouraging to know that other people deal with the same things I do. You’ve encouraged me to look for the good in today! So insightful. Looking forward to the next few weeks. Thank you so much. Couldn’t have come at a better time for me. Great article, timely for me as I was “hating this day” for a while this morning, lol. I look forward to the rest of the series! Thanks for the lovely post. I’ve been working on having a more grateful outlook lately, and it’s hard work! Thank you for reminding me to put on some rose colored glasses and for also acknowledging that it takes work (and that we’re not bad people just because we sometimes have to work at being grateful). Ooh, yes. It’s hard work, even for those of us who naturally tend to be a bit more optimistic! My older son accused me of being “like Buddha, and always seeing the positive side of things” the other day which made me laugh. The funny part is that my son thought he was giving me a criticism, when in fact it was a compliment. It’s all about mindset, and I am learning more and more about how we are in charge of our own happiness. Thanks for the lovely column. Hee. Mr. FG thought calling someone “a Pollyanna” was an insult. I have since corrected him. I call that “ruminating,” and I agree, it is a clear path to discontent. Sometimes small things really annoy me, but lately I have been much less upset by them. For example, our mail carrier seems to regularly give us our neighbor’s mail (and vice versa). I used to rant about how it’s his job, and can’t he even do it right, blah blah blah. But now, suddenly, it doesn’t bother me at all. It’s not such a big deal, I just walk next door and drop off her mail. I don’t love it in the freezing weather of February, but in the scheme of life it’s just not much to worry about. Whenever I’m feeling down or crabby, I repeat that to myself several times. It’s kinda silly, but it works for me. I only get to live this minute/hour/day/week one time, so I might as well find the enjoyment in it. Thanks, Kristen, for this series. Very interesting so far! OH I love James Taylor I can never be sad listening to his music. It’s so soothing. Thank you so much for doing this series Kristen! I think all of us suffer from being discontent from time to time. It’s due to unrealistic expectations mostly. I am so glad to see that you are teaching your kids contentment while working on it yourself. I am super excited to see more of these posts…I need it! God Bless. I so agree on the expectations part…I’ll elaborate on that more in the coming weeks. Love this post. I am driving a 1996 saturn that we bought brand new. I would love a newer car but I choose to spend that money on other things that mean more tome. The thought of a car payment …..it is not for me right now. Also I think it is very impotant to be greatful for health and family every day. Some are born with things like Cystic Fibrosis, like my brother. This seems to put a lot of contentment into me as I see how he has to live. In and out of hospitals all the time. It seems we need more contentment in this day and age dont we? Let’s do it ….be happy with what we have and stive to be better but be happy every day for what we do have in life. My father had me do the same thing growing up. He told me that every night before I went to bed, I should write a “gratitude list”. It was very hard to feel bad when I saw how many things I had to feel grateful for! I struggle like most other people with trying to be content with our lives. I am so thankful to have a roof over our heads, fresh food, a husband with a reasonable income, health care and family. I too have wanted to be a stay at home mother but my husband does not make enough to make it feasible, plus he works a 3 week rotation with evenings, weekends and really long days in the mix. There is no consistency and it is so hard to find a job that can go around his schedule in addition to finding part time childcare and driving my daughter to her competitive gymnastics. I am stressed that if I go back to work this January I won’t be able to be the mother I want to be as well as having the career that pays the bills. All the money I will be making will be going towards more gas, new clothes (sweatpants won’t cut it :), daycare, more convenient dinners, after school care, weekend cleaning and laundry..and the list goes on. I am content right now without extra money! Hugs! Mr. FG worked a rotating shift for a while there and it was rough…we could never quite get settled into a routine (by the time we did, the routine changed!). I spent most of yesterday worrying about ominous changes on the work horizon. At the library where I volunteer, I recently found a book called “29 Gifts – How a Month of Giving Can Change Your Life”. I started it yesterday and finished it early this morning. Then I got up and read your post. I think the universe and the Lord have a message for me and I hear it loud and clear! Thanks for the inspiring post, Kristin. I read that book last fall, and gave a few copies for Christmas gifts. It definitely made me think about what you can give that isn’t money, and it was very inspiring. This is sooo true, it really is all about the attitude. My thought process on just about every thing is that “it could be so much worse than it is” and it’s the truth. We’ve been in some pretty tough situations, but there was always a worse place to be … reminding kids of that is pretty important too! Thank you for this…. I do tend to always say “When X happens, then it will all be better.” Right now, it is that when my daughter talks, I will understand why she gets upset. But the fun part right now is that she doesn’t talk yet, but how she is learning to talk. And copy the sounds we make and use some sign language we have taught her. And she makes jokes and is funny even without talking… And I know when she doesn start to talk… watch out world. So, with your inspiration, I am going to continue to see the good in it all. Before my mother died, she wrote me a note and put it in my lunch (I was home after college and working part time) – it said “Find joy in your day”. I have it framed and visible for me to read daily. I know that it has nothing to do with the post but i was just wondering this morning, did you ever used to have a career before the kids came along?Just curious? I clipped a “Mutts” cartoon from our paper a couple of years ago and keep it on the refrigerator. It shows one squirrel giving another squirrel an acorn. The cartoonist included a simple saying: “Who does not thank for little will not thank for much”, which is apparently an Estonian proverb. I love this proverb as it seems to wrap up in one sentence the very root of this subject. Ah, this is a lovely post and such a good reminder. I also love how you shared how you put it into context within your own personal life! Thanks for being transparent It’s encouraging!! Kristen, I’m so glad that you’re writing this series! Contentment is something I struggle with a lot, and I have a tendency towards depression and negativity. These are some really good ideas. I find that when I purpose to be thankful, I feel better mentally, emotionally, and physically! I believe that there are healing properties in being grateful and looking at the positive. Prayer is another thing that helps me to be content. When I focus on God, how He loves us and cares about everything concerning us, I start to feel much more joyful and peaceful! Have an Attitude of Gratitude! Great post. Thanks Kristen! This is a well written and extremely helpful post. I look forward to the others. I think I need this series. Thanks for sharing. I just finished a book written by a Halocaust survivor. Her husband and 3 year old daughter died in Auschwitz. It puts things into perspective, and it is hard to be discontent about minor things when there are people who have experienced evil beyond comprehension . Somehow my gripes about my worn carpets seem really, terrribly wrong. Contentment can only come from knowing Christ, and not from things. Good post. Thank you thank you, this is something I deal with almost daily, I could go on and on with my complaints, but then I realize, I don’t have so bad compaired to alot of other families out there today, and just living in this country is enough for me at times, I mean, we drive on roads, and have more freedom, just to name a few. Anyway, this will be great to read up on and stay reminded, God is good and he always meets my needs, food, clothing, shelter, and a healthy family. What else is there! God Bless you! One of the biggest things I’m not content with is the fact that I don’t have a job. However, we were lucky enough to be able to buy a nice house and we can make the payments and pay our bills on my husband’s salary. We certainly aren’t rich by society’s standards, but we are making ends meet, and that’s important. Thank you for a great post! I had to laugh when you were describing how you helped Sonia deal with her bad day by counting her blessings. My mom did the exact same thing with my siblings and me! It helps get you through the rough times and disappointments, for sure. I have also found that when I pray at night if I start with being thankful for my blessings, there are fewer wants to ask Him for at the end. I appreciated your thoughts. I hate having to work, too, but it only has to be two days a week and I get a huge discount on dental care for my family (which is a blessing, because my hubby is self employed and we can only afford medical insurance). There is always a silver lining if you look! By the way, I know that I don’t know you personally, but I think you do a fabulous job of anything you take on. I am very impressed! Thanks so much for this post. I was just complaining to my husband today that it is time to move closer to family. (We are three hours away and in an urban setting; I much prefer the suburban setting of my hometown.) However, it won’t even be an option to leave for two more years, so really, all I am doing is making myself miserable. I enjoyed reading your post and look forward to the rest. I might as well be content with where we are since we need to stay. The apostle Paul summed it up well, “Not that I speak in respect of want: for I have learned, in whatsoever state I am, therewith to be content” (Philippians 4:11, KJV). Great series! Good series. My youngest son used to look at the houses we drove past and say things like, “Look at that house! They are so lucky to get to live there! I wish we had a house like that!” It really bothered me, so I started talking to him about how lucky we were to have the house we had. Then I pointed out that he had a friend who lived in a small apartment, and he had a cousin who lived in a very small house that used to be a garage. Compared to them, we were definitely very blessed. I think it helped him to be more content with our home. This weekend I will sit down and write down all the positive things about this year’s horrible events and about the things I really want to change, but can’t be changed right now. I really love this post. What a reminder for us all. I just posted this morning on going without a dishwasher – isn’t our culture so interesting that to NOT have a dishwasher deserves its own blog post???! Thank you so much for this series on contentment! I’ve gone through stages where it seems like I was waiting on life to happen, then I realized IT IS happening. I’m trying to be more content and enjoy the moment. Life is so short. Thank you so much for this post. My husband and I had a disagreement yesterday that led to an argument. “Hopeless; it’s all hopeless,” was my attitude until I saw the news last night of Peace Corps volunteers and their living conditions. It dawned on me, as I was getting ready for bed, I have a toilet to flush instead of a latrine; the light switch turns the light on, instead of darkness; if I’m cold, I turn on the heat; if I’m hot, the a/c is available at the flip of a switch. We have a car that is paid for; my husband has a good, steady job. Our refrigerator is bursting at the seams after my monthly grocery shopping. I could go on and on about material things. But I am also so grateful for my family,my two daughters and one son; my eight grandchildren (four of whom live within 2 miles of me); my husband who is the model of patience (most of the time). My church family, and especially my God, who loves me with an everlasting love – even though He knows me well, warts and all! Thank you so much for your post. We need reminding…. I read this post and realised how much I am missing in life. Recently we have shifted to a 3 bedroom apartment and are in the middle of arranging it. And do not seem content at present. Also, I always preferred a cottage home. But had to opt for an apartment , for convenience sake. But after reading your post, I decided to be happy and go ahead with a smile in life. Thanks ! Read the work thing about Mr. FG……….I have to be to work at 5AM 5 days a week, and have the same days off. Sunday and Monday, so I definitely share your pain! I know exactly what you are talking missing out on Friday night fun. But I have come to embrace my schedule. It takes some adjusting and planning, but I make it work. I am grateful for a full time job. I like having a weekend day and a weekday off. I have been reading your blog for a year or two and totally enjoy it, though I rarely comment. I too feel very discontented because I too am a stay at home mom with my only son busy with college studies and so also my hubby with his work. I feel useless and frustrated sometimes but your post has made me think and think positively about my situation…. sunshine, gave me your link. I was in the discontented boat last week and she sent me your blog. Thank you for talking; although it is far more thereputic for me to be in person! I wish I could find someone here in KY to pull and lift me up when I’m stuck in the mud. I also homeschool 4 youngens. Thank you agian for helping me see some light; sometimes the mud is so thick i’m going to die!